To be quite honest, there are certain dishes that I never intended to include on this site because they have been so completely bastardized by restaurants across the country. Shrimp Creole is near the top of the list. Why would I want to include this dish? Everyone has a recipe for it. A lot of restaurants, even outside of Louisiana serve it. Why in the hell do I even want to bother? Everyone knows what Shrimp Creole is! But then it dawned on me. You know what? Maybe because of all the hack versions out there, a lot of people, especially outside of Louisiana, don’t know how great Shrimp Creole can be! Every bad rendition of Shrimp Creole, just like Shrimp Etouffee, served in some dive restaurants across the country, have created a perception to the diner that this dish is just OK, or in the worst case scenario, absolutely horrible. For God’s sake, some restaurants even serve shrimp covered in canned Marinara sauce and pass it off as Shrimp Creole. Yikes. 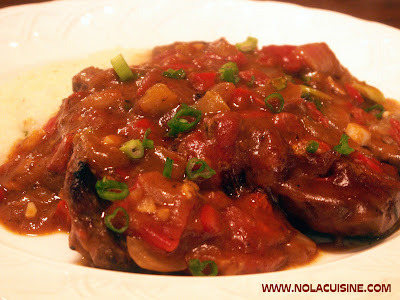 There are a lot of good and bad recipes for Shrimp Creole out there, hopefully you will enjoy this one as much as I do. 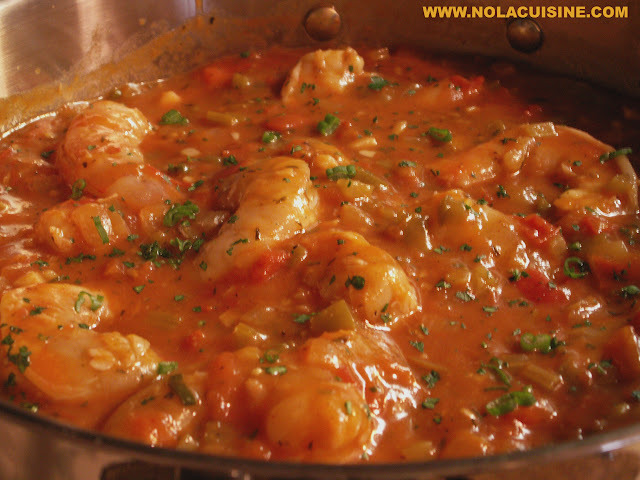 The defining factor that I think makes this dish great, instead of just good, in addition to the use of the highest quality Louisiana or Gulf Shrimp, is using homemade Shrimp Stock in place of water during the preparation of your Creole Sauce. As I see it, Shrimp Creole and Shrimp Sauce Piquant are pretty much the same dish, with a few differences. 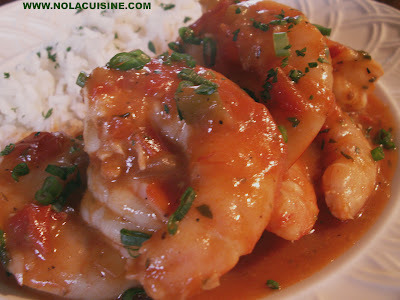 First, Shrimp Creole, or as it was once known, Shrimp a la Creole, is a New Orleans dish. Shrimp Sauce Piquant is Acadian, much spicier (hence the name) and usually, but not always containing a roux. But as I said, they’re pretty darned similar, and like most dishes in New Orleans these days the two cuisines have kind of merged in a lot of different areas. Like any dish that there are a trillion recipes for, it’s all a matter of your personal taste. Like I always say, let’s not fight, it’s only dinner after all, just make sure it tastes good. Melt the butter in a large sauce pan with the vegetable oil over medium high heat. When the butter begins to froth add 1/2 cup of the onions. Cook, stirring occasionally, until the onions are golden brown. Add the remaining onions, celery, and bell pepper, reduce the heat to medium and season with 1 Tbsp Creole Seasoning and a healthy pinch of salt. Sweat the vegetables until soft. Add the tomato paste mixing well, and cook, stirring constantly, until the paste begins to brown, then add the fresh tomatoes and another healthy pinch of Kosher salt, this will help the tomatoes break down. Stir well. When the tomatoes start to break down into liquid add the white wine, and turn the heat to high until most of the alcohol burns off. 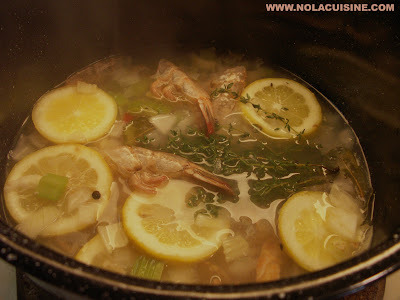 Add the Shrimp Stock, remaining Creole seasoning, garlic, bay leaves, black pepper, white pepper, cayenne (to taste), and Thyme. Bring to a boil then reduce to a low simmer. Simmer for 30-45 minutes. Add the hot sauce, Worcestershire, and season to taste with Kosher salt. Last chance to re-season your sauce, remember that good cooking is all about proper seasoning. Make your Boiled Rice, and season your shrimp with 1 Tbsp Kosher salt and a pinch of Cayenne. Bring the sauce to a boil, reduce the heat to low and add the shrimp. The key is to not overcook your shrimp. Let them slowly simmer in the sauce until just cooked through. Serve with boiled rice and garnish with the remaining green onions and parsley.